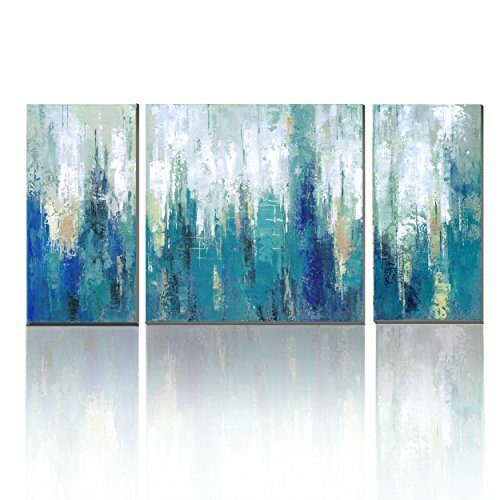 cubism- Canvas Print 3 Panel Blue Abstract Modern Wall Art for Home Decoration ,Ready to Hang! The painting is the best choice for decoration of homes,hotels,restaurants, office buildings, KTV, also a wonderful gift for all occasions to friends and family to share. Actual painting may be slightly different from the product image.. This size is relatively medium size, suitable for hanging in the bedroom, study, entrance, living room ... but hung behind three large sofa will be small. Please carefully compare the size is suitable for your needs. 2.Gallery wrapped, stretched with inside frame on the back. Ready to hang. Packed in Carton Box. 100% satisfied guarantee. Buy with confidence! 4. A good choice for wall decoration, suitable for Home and Office, Bar, Hotel... It is also a wonderful gift idea for friends and relatives. 5. The painting been shipped by AMAZON, it normally take 1-2days to arrive.Thanks your choosing of "cubism" art, we wish you a pleasant shopping !